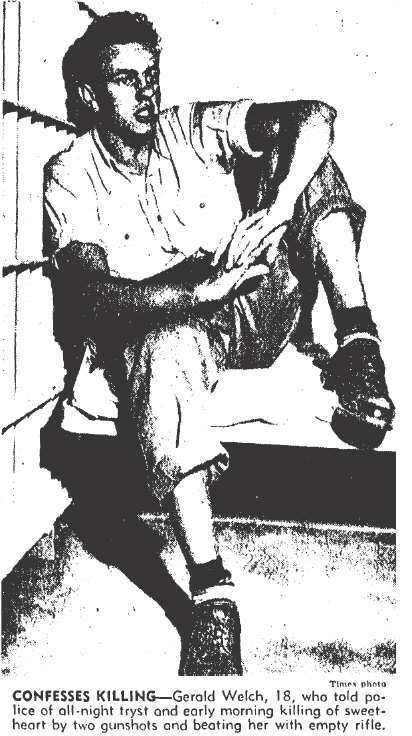 Pasadena police were stunned when, early on the morning of April 19, 1947, 18-year-old Gerald Snow Welch arrived with the dead body of a girl in his car. He coolly announced to officers his “purpose in life has been completed.” What in the hell was he talking about? Who was the girl and how had she died? 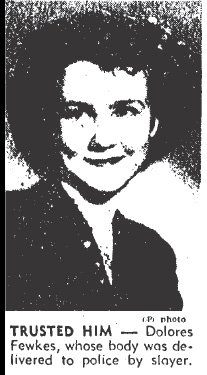 Gerald identified the girl as his 16-year-old sweetheart Dolores Fewkes. He claimed that he and Dolores had planned to die together but he survived due to a miscalculation on his part. He had brought only two bullets with him to the deserted picnic grounds in the San Gabriel Mountains where the couple planned to leave this world behind. He thought two rounds would be enough, but when Dolores failed to die immediately after the first bullet entered her head, he fired again. The second round entered her skull about a half an inch from the first, but it didn’t kill her either. She started to scream and wouldn’t stop. He told police that he “finished her off” by battering her to death with the stock and barrel of the .22. “If only I had taken more bullets…” he told police. Once Dolores was dead he put her bloody body into his car and drove her to the police station where he confessed. He told investigators that he felt “no sorrow, no regrets” about the slaying and was convinced that Dolores was surely in heaven awaiting his arrival. “There won’t ever be any change in my feelings. I loved her and she wanted to go with me into the next world. It will be much happier and better there.” Then he explained that he’d rather let the State kill him but: “…I would kill myself if I got the chance.” Gerald appeared to be in no hurry to make good on his threat, he sat on the bunk in his jail cell and stared at the ceiling. Strange as they were Gerald had given his reasons for wanting to die, but his contention that Dolores couldn’t bear to be left behind needed further examination. Everyone who knew the Montebello High School student said that she was a happy girl with a lot to live for. Did she have a secret dark side that she had revealed only to Gerald? Had she willingly entered into a suicide pact with him, or was he lying? NEXT TIME: Dolores’ family disputes Gerald’s story that she wanted to die with him and accuses him of cold-blooded murder. Welcome! The lobby of the Deranged L.A. Crimes theater is open! Grab a bucket of popcorn, some Milk Duds and a Coke and find a seat. 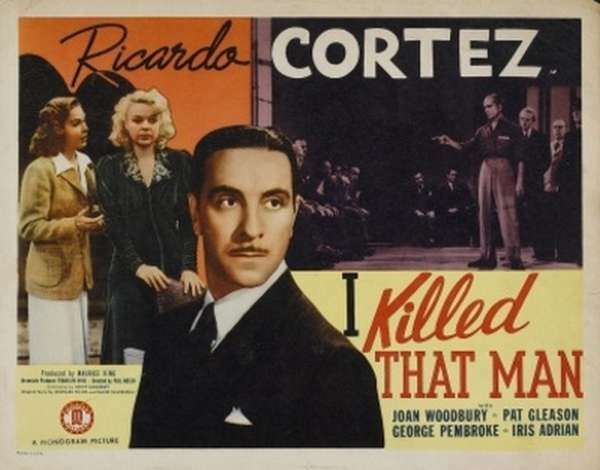 Tonight’s feature is I KILLED THAT MAN, starring Ricardo Cortez, Joan Woodbury and Pat Gleason. Enjoy the movie! Assistant District Attorney Roger Phillips, various reporters and other officials, gather at a prison to witness the execution of convicted killer Nick Ross. Before being strapped to the electric chair, Ross makes his first public confession, and says he has been protecting the identity of the man who ordered the killing. As his boss has reneged on his promise to free Ross, Ross intends to identify him, but suddenly dies when he is hit by a poisoned dart. Dr. Williams wasn’t alone in believing that epilepsy was an inherited mental defect that could result in criminal behavior. It was one of the conditions which some members of the medical community hoped to eradicate through involuntary sterilization and selective breeding. The social movement that endorsed such repugnant beliefs was known as Eugenics and was practiced in the United States for years before it became part of the Nazis plan to breed a race of Aryan Ubermensch (supermen). Fitts wasn’t the only one confounded by Alsa’s confessions. The Lunacy Commission (no, I didn’t make that up), ruled that the child was mentally sick and bordering on insanity, but that she was not dangerously insane. It was about time that the authorities looked into Alsa’s caretakers. It was Inez Platts who had charged Alsa with attempting to poison her family and no one seemed to have done anything other than take her word for it. During an interrogation Inez admitted that there was at least one night when Alsa was bound hand and foot. The consensus was that both Alsa and Maxine would be better off away from the Platts’ home. Russell again expressed his belief in Alsa’s innocence: “My child will now be allowed to get the proper care and I am sure it is the best thing in the world for her. I think she is better away from the influences to which she has been subject, including her mother. I have nothing further to say. I will not capitalize in any way on my child.” Russell further denied earlier reports that he and Claire might reconcile. In fact he filed a petition in Juvenile Court asking that his youngest daughter, Maxine, be made a ward of the court until he could be granted full custody. 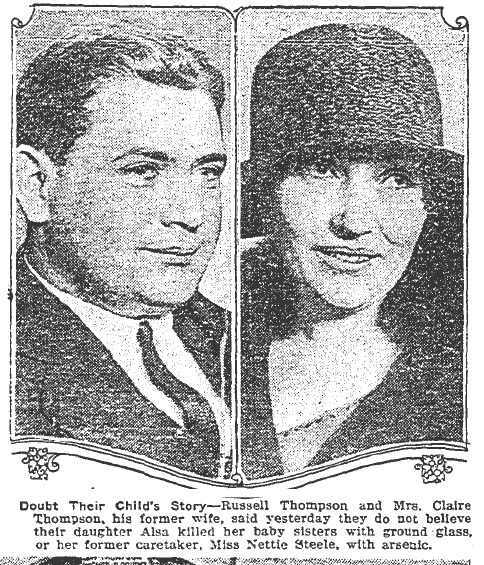 It was interesting that Russell included Claire as a negative influence in his daughters’ lives. The courts must have agreed with him because he was awarded custody of both Maxine and Alsa. In retrospect it seems obvious that Alsa’s unsettling confessions had been false—the product of twisted suggestions by an adult—but whether it was Claire or Inez it’s impossible to say. Just because Alsa wasn’t really a Baby Borgia, doesn’t mean that there is no such thing as a killer kid. 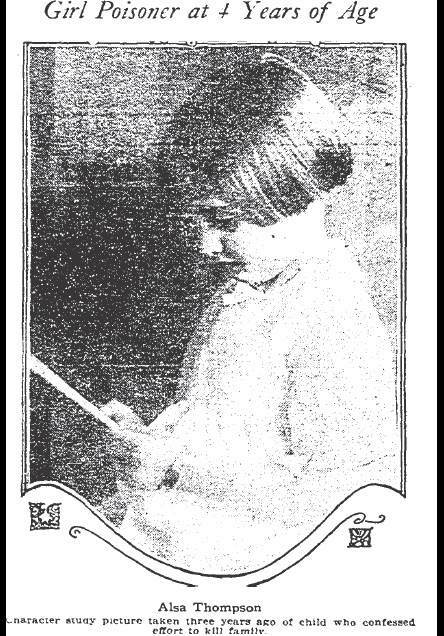 In May 1929, four years after Alsa made headlines in L.A., six-year-old Carl Newton Mahan was tried in eastern Kentucky for the murder of his friend, 8-year-old Cecil Van Hoose. The two had been out looking for scrap metal to sell. They fought over a piece of scrap and Cecil smacked Carl in the face with it. Carl shot Cecil to death with his father’s shotgun. He was sentenced to 15 years in reform school, but a judge issued a “writ of prohibition” which allowed him to remain free. There are other cases of kids who kill, but Alsa wasn’t one of them. Alsa and Maxine must have been relieved when they moved to Orange County to live with Russell. As far as I can determine from census and other records once Alsa was away from the Platts’ and the influence of her mother she lived a normal life. She passed away in April 1994 at age 77. 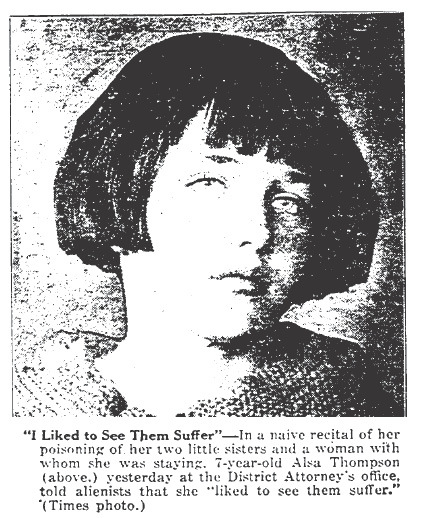 On February 3, 1925 a bizarre story broke in the local news — it was alleged that seven year old Alsa Thompson had attempted to murder a family of four with a mixture of sulphuric acid and ant paste she had added to the evening meal. The intended victims tasted the food, but it was so awful they pushed their plates away. Could a seven year old actually conceive of such a fiendish plan? Evidently the Platts family, with whom Alsa had been living following her parents’ separation, thought so. It was also revealed that Alsa had taken the blade from a safety razor and slashed the wrists of her 5-year old sister, Maxine, with with whom she’d been playing. Inez Platts told the police that Alsa had come to live with the family in their home at 1540 1/2 McCadden Place, Hollywood, only two months before the poisoning incident. Alsa’s mother, Claire, worked in a downtown department store and her father, Russell, worked in Santa Ana. Apparently neither could manage custody of Alsa at the time. Inez said that ever since Alsa had arrived family members had fallen seriously ill and were under the care of their family physician. Mr. Platts had lost his voice and a couple of the children had suffered from mysterious pains. Investigators spoke with anyone who had come in contact with Alsa and discovered that she was extremely gifted — she was already in the eighth grade. Her teachers described her as one of the best students they’d ever had, and added that she had never caused them any trouble in the classroom. Alienists were baffled by Alsa, the doctors said that they had never before encountered a case of homicidal mania in a person so young, particularly when there was no apparent grudge against the victims. Russell Thompson was vocal in defense of his daughter: “Alsa never poisoned any one.” When Russell was informed that Alsa had further confessed that as a 4 year old she had put ground glass into the food of her twin sisters and killed them, he said that the statement was absurd. “The twins died when they were 2 years and 2 months of age. That was in Canada. We had two doctors and a nurse in constant attendance on them when they were ill, and they said death was due to intestinal troubles. Alsa couldn’t possibly have had anything to do with that.” No one could fault Russell for believing in Alsa’s innocence, but had he been deceived? In his 1954 novel THE BAD SEED, William March tells the deeply disturbing tale of 8-year-old Rhoda Penmark whose mother, Christine, begins to suspect her daughter is behind a series of “accidental” deaths. When Christine’s worst fears are confirmed she has to make the difficult decision–what to do about Rhoda. If you’ve never read the book or seen the 1956 film adaptation you should. Each has a different, but shocking, ending. Was Russell wrong? Had his beautiful daughter committed murder? NEXT TIME: Find out if Alsa’s father was right about her, or if she was actually a high functioning sociopath capable of multiple murder, in the the conclusion of Baby Borgia. NOTE: Many thanks to Alex Cortes. It was a conversation with him about this twisted case that lead to this post.